Do you need affordable, yet stylish choir or orchestra performance attire? 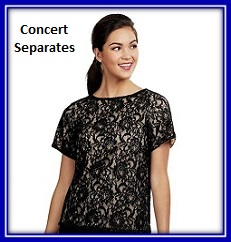 We have a large selection of formal wear for performers on our Concert Dresses page. You�ll find items such as long black choir dresses in a variety of fabrics such as knits and matte satins that are ideal for College, Middle, and High school choirs and orchestra members. Choices of short, three-quarter, or long sleeves along with a choice of necklines allows Community and Civic members to choose a new signature look for their group. 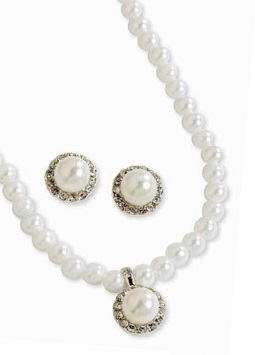 Our modest designs, can only be topped by our Superior Customer Shopping Experience. Super friendly customer service representatives, secure order checkout, and fast delivery options are among the many perks that YOU can enjoy by shopping with us. Don�t let our name fool you. 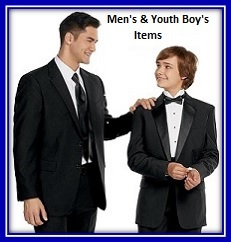 At �Formalwear-Outlet� we take pride in the items we offer and look forward to serving your needs. Belong to a Fraternal Organization, such as the Order of the Eastern Star? If you are looking for a lined, formal length, white installation gown, we have them along with cover-ups available in a wide range of colors. Installation gowns are also available for officers in Star Point Colors in both missy regular and plus sizes. Don't forget! Brides, you will find contemporary and modest bridesmaids dresses in the season�s hottest colors that are available in both regular and plus sizes. 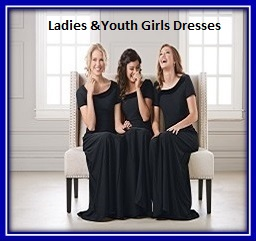 Turn a sophisticated concert choir or orchestra gown into the perfect dress for your ladies! You can even color coordinate the groomsmen with our great selection of tuxedo accessories, such as vests, ties, and pocket squares.